By its very nature, providing reliable, safe and accessible public transportation brings environmental and social benefits. These benefits include reduced greenhouse gas emissions and improved air quality, less traffic congestion, and wider access to jobs, markets, education, healthcare, and social opportunities. At Metrolinx, our mandate is transforming mobility across the GTHA. The Regional Transportation Plan guides the work being done to provide an integrated transportation system that contributes to a high quality-of-life, a strong, prosperous and competitive economy, and a protected environment – now and in the future. Advancing this work remains our priority and a significant way that we contribute to sustainable development. We also want to ensure that we are embedding sustainability into our culture, processes, policies and decision-making processes. The Metrolinx Sustainability Strategy (2015-2020) builds on the Regional Transportation Plan by focusing on how Metrolinx can plan, build and operate to achieve meaningful progress towards sustainability in areas that are not addressed in existing Metrolinx strategies and plans. It helps us think differently about how we build infrastructure, manage our operations, and serve the growing communities of the GTHA, and gives us a common understanding of how we will measure and track our sustainability efforts. We invite you to download the Metrolinx Sustainability Strategy, and to engage in our sustainability journey by sending your feedback and comments directly to sustainability@metrolinx.com. In the 2015-2020 Metrolinx Five Year Strategy, Metrolinx committed to achieving full signatory status for the International Association of Public Transport’s Sustainability Charter by 2016 and Gold status on American Public Transportation Association’s (APTA) Sustainability Commitment by 2017. 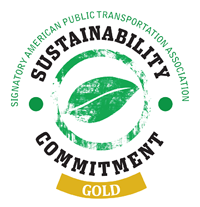 In April 2015, Metrolinx became one of twelve North American public transportation agencies to achieve APTA’s Gold sustainability status, two years ahead of our commitment. 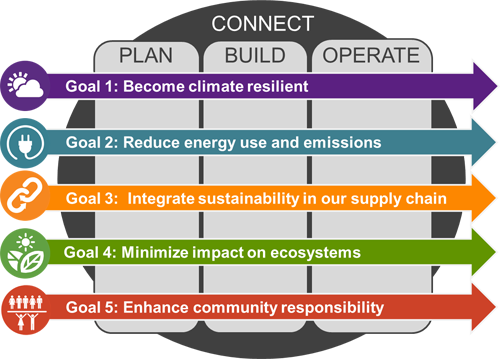 The Sustainability Strategy focuses on five priority goals. Within each goal, actions and measures of success for 2015 – 2020 have been defined. Beyond 2020, we will continue to maintain our commitment to sustainability and continuous improvement. Climate change continues to present a complex challenge for the region and transit operators. As committed to in the 2015-2020 Metrolinx Five Year Strategy , we are developing a corporate Climate Adaptation Plan. We recognize that ensuring reliable and safe service goes hand-in-hand with understanding and mitigating risks related to changing weather patterns resulting from climate change. These include more severe heat waves, increased snow fall, higher rainfall and flooding, and more frequent ice storms. Collaborating with internal and external experts to ensure we take a holistic approach to developing the Climate Adaptation Plan. Click here to learn more about how Metrolinx is working to build a climate resilient transportation system across the GTHA. Engaging employees by training and empowering operating divisions to identify, plan and report on their own energy and emissions management projects. Metrolinx has been recognized for our successes in engaging our staff on energy management. Check out this video from the Canadian Urban Transit Association on Metrolinx’s Excellence in Energy Management. Click here to learn more about how Metrolinx is reducing its energy use and GHG emissions. Metrolinx has a unique ability and responsibility to consider the sustainability impacts in its supply chain and from purchasing decisions. We are working to establish criteria for evaluating contracts and purchasing through a sustainability lens. Further, since 2009, we have been certifying our stations and facilities to Canadian Green Building Council’s Leadership in Energy and Environmental Design (LEED) standard. To date, we have five LEED Gold and two LEED Silver certified stations and facilities. This number will continue to grow, with a number of projects currently under construction aiming for LEED Silver or Gold certification. Click here to learn more about how Metrolinx is integrating sustainability into its purchasing decisions. Along with building a transportation network to serve the needs of the region, we want to also understand our impact on the natural environment to ensure that we may avoid, or take any necessary steps, to mitigate adverse effects. We work closely with the Province, conservation authorities, and other stakeholders to ensure that management of water and the impact of climate change are evidence-based, practical, and robust. Click here to learn more about how Metrolinx is working to protect ecosystems and the natural environment. As we continue to build transit infrastructure, we recognize our responsibility, and the opportunity, to leverage our significant investment in the GTHA to create lasting social and economic value for the communities in which we work. In 2013, Metrolinx established a Community Benefits Framework with the Toronto Community Benefits Network for the Toronto Light Rail Projects, including the Eglinton Crosstown. Click here to learn more about how Metrolinx is working to enhance community relationships and benefits. The Metrolinx Sustainability Strategy (2015-2020) commits Metrolinx to establishing a Corporate Climate Adaptation Plan by the end of 2017 and the Planning for Resiliency report is an important step towards this goal. The report outlines the broader context and rationale for climate resiliency and adaptation and documents Metrolinx’s experience to-date with extreme weather events and examines how we have managed the impacts through reactive and proactive responses. The report also describes climate change projections that can be applied across the GTHA, most notably up to the year 2050, and details global best practices for developing measures to build resiliency to climate change and extreme weather. Metrolinx is playing a critical role in building and expanding the regional transit network of the GTHA, We must be open to thinking differently about how we plan, build, operate and connect in order to remain at the forefront of a sustainable urban transit system. The focus of our innovative thinking is on helping people move around the GTHA and access transit as seamlessly and efficiently as possible. Many of our parking lots are at or nearing capacity and we need new ways of getting people to our stations to accommodate growth. Metrolinx is exploring how new business models, the sharing economy, technology advancements, and active transportation can improve the way people travel and connect to public transit. In partnership with Smart Commute, we are looking at opportunities to support a sustainable and integrated transportation system that emphasizes walking, biking, carpooling and transit. Innovation starts with our employees and it is embedded in our core values: Serve with Passion, Think Forward, and Play as a Team. Metrolinx continues to foster new approaches to sharing, recognizing, and celebrating innovation in order to encourage creativity, critical thinking, and collaboration among our employees. To date, we have established an employee mentorship program, an awards program to recognize innovation within the organization, an Inspiring Speaker series, and change management training. We also launched Ideas@Work, an internal collaboration platform for all employees to share new ideas and spark discussion on how we can enhance efficiency, increase productivity, reduce costs, and create a safer work environment. As our journey in sustainability and innovation continues, please connect with us at sustainability@metrolinx.com to provide your feedback or share your stories.